There was a full moon last weekend. My husband and I joined about forty other adventure riders at Bounce Ranch just outside Dripping Springs Texas. The adventure riders or ‘denture-riders’ as he calls them are folks who enjoy riding motorcycles and are from all over the world. Traditionally they post photos of rides with their bikes posed in front of some spectacular scenery. They also imbibe heavily—and they tend to shout a lot particularly at night. Maybe it was the full moon, but my husband says no. We have worked on our camping setup this past year. The purple pea-pod hammocks require trees set at certain distances or sleeping person finds bottom side touching ground—and the mosquitoes seem to find their way into the hammock. An air mattress with sleeping bags in the bed of my truck makes for much more comfy sleeping than on the ground amongst the fire ants. Our last addition was the EZ-up, a canopy over the bed of the truck and a great improvement over the tarp we bungied to various parts of my truck. We think some mosquito netting will be our next addition. The great thing is that all of the parts are easily replaced and much less costly than a camper. 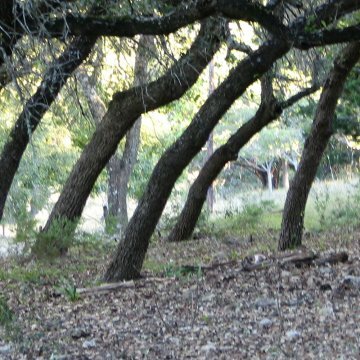 Bounce Ranch is in the hill country and features lots of trees and rocks. My husband parked my truck on a slight angle to aid in the off-loading of the bikes but it was at such an angle, my feet slid off the air mattress so that they were directly on the bed of the truck. Temps were mid 70’s in the day but dropped down to low forties-high thirties at night. I can’t remember when I last stayed in bed until 10 because it was so cold. My sweet hubby, though, made coffee for me on a little propane stove with the assistance of another camper. We had a huge bon-fire, explored the tree-house, watched the dogs race around just like little kids, took photos, and in general just sat around. A few took some short rides, but most of the riders checked out each other bikes and told lies—err—stories while consuming four kegs of assorted beers. I thoroughly enjoyed reading a paperback from cover to cover without interruption. A couple of the riders love to cook and so they prepared barbecue the first night, shrimp poppers and rib-eye the second night. Breakfast was banana-pecan pancakes on Saturday and breakfast fajitas the second. People brought food to share—a wonderful rum-pecan bundt cake, Texas Pie company peach & Strawberry pie, campfire beans, pico, and then there were the pickled eggs. It was a good weekend. Sometimes it’s good just to do nothing at all and recharge the batteries.